I saw Santa Punching Arius, because he denied the Divinity of Christ! During the Council of Nicea in the Fourth Century, the Church was attempting to settle a great division among the faithful: Was Jesus Christ truly God. The priest Arius was the head of the delegation which denied the divinity of Christ. In his role of bishop St. Nicholas also attended the Ecumenical Council at Nicaea, where according to legend he decked the heretic Arius. In the middle of his hearing, Arius stood up on his seat in order to be better heard. 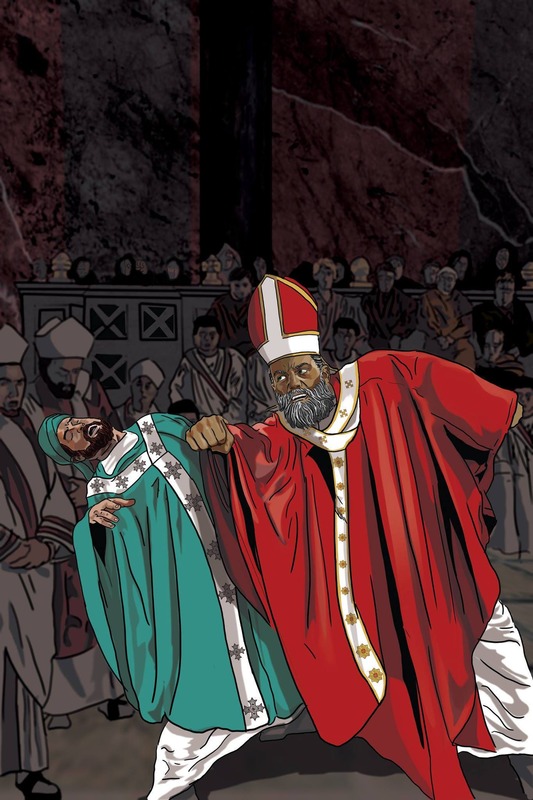 Enraged by Arius’ denial that Jesus Christ is true God and true man, Archbishop Nicholas strode quickly over to Arius, pulled him down by his beard, and punched him in the face. The scandalized council fathers sprang upon Nicholas, stripped him of his pallium (a sign of his office as archbishop), and threw him in prison for his violent behavior. That night Nicholas was visited by Our Lord and Our Lady who loosed his bonds and vested him again in his Bishop's vestments. The bishops were astonished by this miracle and realized that Nicholas’ anger was righteous and done out of love for Our Lord. He was honorably restored to his chair—where the aged Bishop slept through much of the remaining proceedings.